Every teacher in our school has been provided with one this year so it’s a question that’s being asked a lot in and around the staff room. I only hope the answer is something more productive than using it as a chopping board! I am a big believer that technology has a major part to play in enhancing the education of our students in, and for, the 21st century. But knowing how to work a device and integrating into lessons as part of a carefully planned (and practiced) pedagogy are very different prospects. I was interested to read a recent presentation by Dr Ash Casey @DrAshCasey about the use of technology in PE. The info Ash presented in this will provide the kick start for our learning team in the PEPLC project an exciting PD initiative for various types of PE professionals, the brainchild of PE guru Andy Vasily @andyvasily. Nathan Horne @PENathan our Innovation and Technology team leader also happens to be a super proponent of tech in PE, check out his blog. We are at an interesting point in education at the moment, especially in PE with the rise of mobile devices meaning that our gyms and playing fields can become genuine technology hubs. If and when we want them too that is. I have to say though, often it feels like teachers have been handed the devices and told to go forth and transform the lives of their students. It almost seems expected that some kind of magic will happen and suddenly iPads and tablets will be seamlessly integrated to stunning effect. Well the hard fact is this, it won’t happen. Not magically like this anyway. Dr Ash Casey describes this as putting the technology before the pedagogy. The vast majority of teachers are products of an era where IT was not a central part of education, or life in general. It’s hard for younger teachers (no less students) to imagine what that’s like, because using technology to do things is second nature. You don’t have to look far to find cool and interesting things teachers are doing to improve their daily/ weekly workflow, and increasing the efficiency of their administration tasks. The ability to find the things that work for you may not have a direct impact on student learning, but it will have an indirect impact. Students will benefit from a teacher who is well organised, quick at completing non-teaching related tasks, and is able to extend learning beyond the 60 minutes of each lesson. Just about every single teacher I’ve ever met is ‘busy’ in the truest sense of the word. Most of this ‘busyness’ relates to things that need doing to support learning. Planning, assessment, reporting, meetings to name a few big ones. I would challenge you to keep a brief diary of what you are doing on a daily/ weekly basis that creates this ‘busyness’ and try to find ways of becoming more efficient. A simple example…if you are finding assessment time consuming and are still conducting “assessment lessons” in your PE classes (taking away from valuable teaching and learning time) then look to technology for a way of doing this quicker and buying some of this time back. There are ideas and apps galore on ways to do this. A simple example is to start by getting your class rolls completed through an app. The easy attendance app I use not only tracks attendance, but also students who might be gone halfway through class for a music lesson, its randomly groups students for teams, picks a single student at random to answer a question and allows me to add notes like you may usually write on paper. All data can then be exported and used for parent info or to check records etc. Add an interactive board to this and students can ‘check themselves in’ to class while you start the warm up as they arrive. No more roll taking! This is where the corporate world is way ahead of us teachers. People in business are constantly looking at ways to work smarter, not harder and they are good at it. Imagine what you could do with those moments in a week you could free up? You might even make it to yard duty on time or be able to eat lunch! How many teachers are ‘stuck’ doing the same things day in day out, year in year out? I don’t know the answer to this but I’d guess: a lot. Working on a daily basis with people who are constantly learning (I’m talking about those little people we work with) inspires me to continually evolve and try to get better. Being relevant and current is a constant challenge teachers’ face. We’ve all heard that great teachers are great learners. The term ‘Professional Development’ is often followed by a collective groan or ignites memories of being locked in a room, a prisoner to some old fellas PowerPoint presentation, the content of which you have long since tuned out of. Well number one, if you are not on twitter. Get on it. Right now. My only twitter regret is that I had not got on it earlier. It’s a smorgasbord of amazing people, ideas, resources and a constant source of inspiration. You just have to find them, which the lovely people at twitter make easy. Being part of this network allows you to learn constantly, often without even knowing it. For me, being part of the PEPLC project is one example of how I choose to spend my PD time. No longer will I be prisoner to non-relevant, frankly boring, PD that will not positively impact the students in my classes (well not of my choosing anyway!). You could say that this is the most important part of using technology at all. After all, what is the whole point of school? “The fact that the massive investment in technology has had such limited impact on enhancing student learning is worrying” Tearle and Golder, 2008. I agree with Dr Ash Casey in that we may be putting the cart before the horse (the technology before to pedagogy). School leadership teams need to ensure staff are being strongly and regularly supported in the practical application/ integration of technology. i.e. get teachers actually doing stuff and seeing the benefits. Having said that, just as we teach our students to be independent learners and problem solvers, we too must be pro-active in learning for ourselves and taking risks in class, and also accepting that it may not always work as we had hoped. There are so many great ways to use and integrate technology in PE. Have a look at the work of Jarrod Robinson @mrrobbo who has been ahead of the ICT game in PE for a long time. Notwithstanding specific ICT subjects, I would argue (clearly biased) that PE provides the most natural setting and conditions for the application/ integration of technology of any subject in the school. The only disclaimer being that it has to be used to add value to what we currently do, and not just as a gimmick. Elaborate 1:1 coaches eye scenarios and drawings to ‘fix’ an incorrect volleyball serving technique should not replace walking over and offering corrective feedback there and then. We also have to think beyond the obvious analysis potential the devices provide. We should not constrict their potential to simply being an effective tool for video/ watching etc. Sportfolios, goal setting, reflection, research, student blogs, peer to peer assessment, learning logs are just some of the ways in which the devices can be used to enhance student learning. Once again it’s about finding what works for you and what makes learning “fizz” most for your students. Remembering that activity time is also an important consideration. When can we play a game? If we were to conduct a poll of the most asked question in PE gymnasiums all over the world I reckon this one would come out on top. What I love about it is that it’s a great question and its a valid question. And we want our students to be asking great questions don’t we? Without going too deep into the traditional versus modern teaching approaches in PE (there are far more qualified people than me for this, see @kellyAnnParry and @pilly66), it is definitely worth exploring the instructional models we use in games lessons and why we teach this way. Anyway back to the question…. I’ve watched (with some delight) lessons where the students ask their teacher this question, and the teacher has actually struggled to give a relevant, detailed, and frankly acceptable, reason for their answer, “we will get to a game at the end.” Is often their response? When in class, I usually have keys, a whistle (sometimes), my iPad and a scribbled-on clipboard. Clearly, in order to achieve the above I have been missing one critical piece of kit. A magic wand. If you haven’t guessed already, between point 2 and 3 is where the wand gets waved and the magic happens. As much as teachers may not want to admit it the students are right. And while the students request may be more about fun and enjoyment than the theory, isn’t it interesting to consider how the two may be linked? Remember students actually enjoy learning. Some of them don’t know this, but its true. I said in my first blog that its not our job as teachers to relentlessly push skill and drill practice. Let me be clear on that. I concede that we have a duty to develop student’s skills and techniques as well as their understandings of the technical aspects of movements and actions. However, the method by which we do this has to be connected to greater understanding of the games. If we consider what we want our learners to ‘know and understand’, ‘be able to do’ and ‘be’ by the time they leave school then it has to be greater than “I can do a lay-up” or “I can hit a softball”. By putting the learner at the centre of games they can pick up these things along the way but they are not the main focus of what we are doing, rather a by-product of it. By playing versions of, and situations from, the game more often this will happen. It will. We are educating their brain and their body. Provided we are there to monitor/ modify/ encourage/ provide quality feedback etc. I had a great example of this recently when I had not even introduced the volleyball spike to a year 5 class and due to the time they spent ‘playing’ the students were spiking before I had taught them too. They were simply solving the next problem the game had presented. Another reminder that I only teach a fraction of what they actually learn in my class. The book Play with Purpose (by Shane Pill) is a change agent for anyone who is stuck in the skill and drill era of PE. I’d suggest every PE dept staff base in the world should have a copy and it should be placed somewhat deliberately on certain teachers desks for perusal. I encourage you to go forth and let your students play under conditions you have deliberately created to achieve what you want. If you are a PE Teacher or Sports Coach then I’m sure you’ve heard (or sensed at least) the collective groan from your students when you call for a stoppage in activity. We make the decision to ‘break’ for a number of reasons. Rest, re-hydrate, modify behaviour, modify rules/ learning conditions, change activity, or to have a discussion about what we are doing, why we are doing it….to name just a few. While the groan could be perceived as a negative, there is a huge positive to be taken from it. It’s a clear demonstration that students are enjoying what they are doing and don’t want to stop. That said, I have toiled with the optimum balance between activity time and stoppage time (often “sitting down time”). Is there such a thing as the “optimum balance?” and does it change depending on what activity you are teaching? When designing learning experiences, I have always focused on how these stoppages and transitions can be best integrated to ensure activity time is maximised, while still checking for knowledge, understanding and allowing for reflection, questions and hopefully even some answers. When using TGfU as an instructional model in games lessons, I really find that putting the students at the centre of the learning allows for more of this type of problem solving activity time, with only short stoppages for modifications, but other non-games activities may be different. Most PE teachers I speak to are obsessed with the concept of keeping lessons active. It seems we, and the students, want to be moving around as much as possible. A noble objective, given it may be the only time some students participate in physical activity in the whole day or week even. But are we too obsessed with it? And does it negatively affect our ability to capitalize on moments where a stoppage may be essential? Or on those spontaneous moments where something really interesting happens? If so, then it shouldn’t. Remember the purpose of everything we do is to facilitate and enhance student learning. So if a learning opportunity presents itself, it’s our duty to take it, even if it affects activity time. In their PHYSedagogy chat, Adam Howell (@thedumbjockmyth) and Andy Vasily (@andyvasily) discuss the importance of using quality discussion time to connect movement to greater understandings and making meaning from movement to reach our goal of fostering a life-long passion for physical activity. I know I have been guilty in the past of seeing something of real relevance occur but allowing things to continue for the sake of activity time. Perhaps only choosing to hit on it later with less effect. The exception being matters of safety where there is no option but to immediately stop. A balance is definitely required though and stoppages must be about quality and not quantity. I have seen firsthand the enthusiasm drained from students by excessive stoppages or breaks that go on too long. In fact I have to admit to being responsible for some of them! Thankfully, not as often these days. When these are considered and laid out you can ascertain how active or passive the lesson is going to be. This is where I think the activity plays a part. I find I have more ‘reds’ in activities like gymnastics where there’s a lot of layering or scaffolding in tasks, to ensure safety. It’s also interesting to consider how the use of technology could also play a part in ‘down time’ still being very purposeful and useful in enhancing learning. I try to ensure these days that any injured or excused students are always given a role in the lesson, and this can vary dramatically. Recently I’ve had them time how long I talk for versus how long the students are active for. The results have been really interesting and possibly something for a later blog. Maximising student learning, while still remembering ultimately we are educating them ‘physically’. So what’s all the ‘fizz’ about? 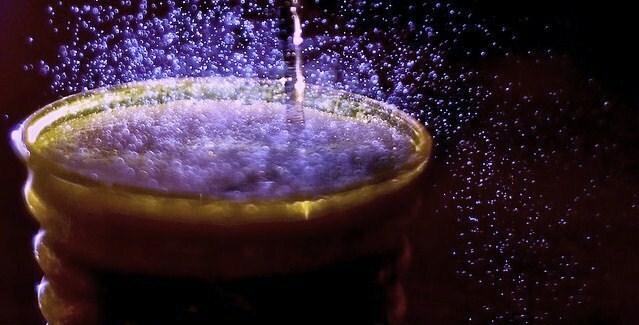 Think of that moment when a fizzy drink bubbles to the surface of the glass, pretty cool huh? Imagine that moment in class when student engagement, creativity, achievement, collaboration, clarity of purpose, fun and genuine learning all collide to make the most amazing learning experience. Our fizz moment. What has become central to my development in recent years is how we ensure that our role as educators is fulfilled in the most valuable way, making every minute count when we have the opportunity to connect with our students. Time allocation for PE in schools is a conversation for another day (or post) but the likelihood is that you share my frustration sometimes over what can be achieved in the time we do have with our classes. Having said that, it is far more more rewarding to look at what we do in the the time we do have, rather than complain about the time we don’t. 1. How theory is taught through practical activity so as NOT to have too much ‘sitting down time’ in class. 2. We are not sport coaches- it is not our job to relentlessly push skill and drill repetition practice, the ideas and concepts we teach have to be bigger, more valuable and have a life long impact. 3. ICT and mobile devices have to be integrated and used with the sole purpose of improving student learning. 4. Sound evidence based pedagogy (much of which is focused on classroom teaching and learning) must be adapted for our gyms, playing fields and swimming pools, to ensure we are having the greatest impact in the time we have. 5. As a physical educator in the modern day, we all have a duty to expel the myth that ‘Gym teachers’ are simply facilitators of play time. Over the coming weeks and months, each of these areas will be explored on these pages. If you are reading this then you are no doubt one of the goodies. Through social media groups, professional development networks, and relentlessly pursuing best practice (and sharing it) we are all responsible for raising the bar and fostering in our students a passion for lifelong health and physical activity. When all of these components are working in synergy, we get those moments in class that are hard to describe. Moments that put the “fizz” in Phys-Ed if you like. With your help and collaboration, I hope we can encounter these moments more often. We can make them deliberate and we can leave our students feeling truly inspired.